They say you always remember your first. The rumors were true. The Nokia 3310 is back. Courtesy of new brand owner HMD, the phone is returning with a mixture of 3310 charm and some specification upgrades. The good news: It's cheap (around $50), it has Snake, along with those nostalgic ringtones of yesteryear, and it seems pretty darn indestructible. It's an iconic phone, but one that's over 15 years old. That's a long time in mobile. Still, a lot of people are going to want one. Do you? When you pick up the new 3310, it's immediately endearing. I'm not sure whether that's due to the bright plastic shell, the reliable click of the number pad, or the sheer ridiculousness of the proposition. I was 15 years old when the original launched. I still owned a hulking Motorola brick with giant aerial, giant black buttons and no cool points whatsoever. I wanted a 3310. For 2017, Nokia and HMD have modernized the design and hardware. The device has smoother, curved lines. Here at MWC, I got to play with the glossy orange and yellow options. 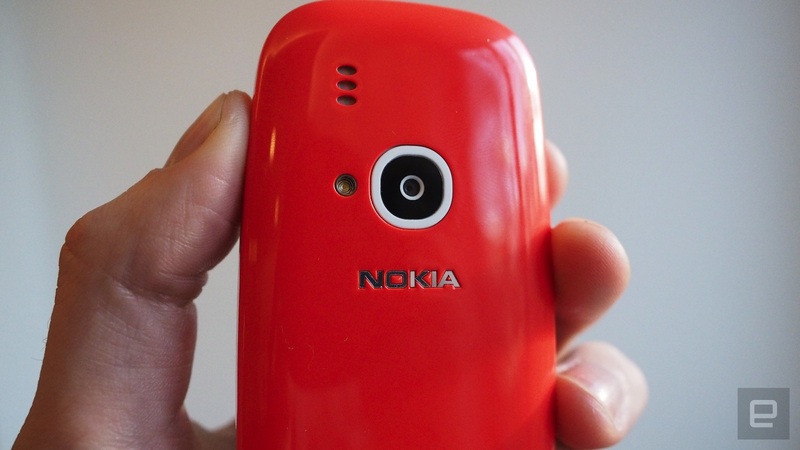 (The 3310 will also launch in matte blue and gray finishes, which sound traditional if a little boring.) Despite the new design, it's still incredibly comfortable to hold, and you might be surprised to see a (2-megapixel!) camera peering out from the back. The updates don't stop there. There's also a color screen (gasp!) and many more internal upgrades (micro-USB charging port, headphone jack, microSD storage and Bluetooth), but it's an unmistakably old-school dumbphone. There's no WiFi, no GPS, no app store. The price reflects this, too: At €49, or just over 50 bucks, it's almost an impulse buy. It's like the NES Mini for Nokia fans. Just not quite as charming. You might also have legitimate reasons picking one up. The spartan 3310 feature list includes slow-speed 2.5G internet, calls, texts, lo-fi photos, and Snake -- albeit a completely new iteration. Those limited features could make it an ideal first phone for keeping in touch with children, using at festivals, or taking to beach when you don't want any work emails or social-network noise. (The built-in Opera Mini browser can handle Twitter and Facebook at a push.) Nokia adds that the battery is good for almost a month on standby. However, let's not fool ourselves: This is unashamed fan service for the many millions who picked a Nokia as their first phone. It might have even been a 3310. The company is trading on that nostalgia as it tries to drag its phones into the future at the same time. The phone arrives globally in Q2 later this season. Click here to catch up on the latest news from MWC 2017.